The world’s best beaches are only minutes from Niceville across the Mid-Bay Bridge. Henderson Beach State Park and James Lee Park are only about 13 miles from the heart of Niceville and both offer parking and family-friendly amenities. John Beasley Park and Newman C. Brackin Wayside Park in Fort Walton Beach (Okaloosa Island) are also popular public beaches with parking and amenities. 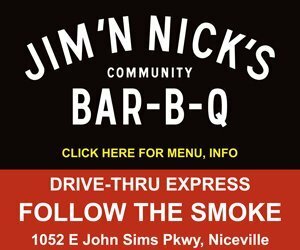 They are only about 14 miles from Niceville taking Hwy. 85 South through Fort Walton Beach. Henderson Beach State Park beach features parking, restrooms, showers, concessions, BBQ grills, picnic tables, a nature trail, campsites and more. James Lee Park is at the beach on the Walton/Okaloosa County line. This beach park has 3 pavilions, 41 picnic tables, 9 dune walkovers, a playground, restrooms with changing rooms, and 166 parking spaces. John Beasley Park is a large beach park on Okaloosa Island with 2 dune walkovers to the Gulf of Mexico. This park has 2 large pavilions, 12 picnic tables, an octagonal platform, restrooms with changing rooms and 208 parking spaces. This public beach and park is on Okaloosa Island adjacent to the fishing pier. It offers several pavilions, 41 picnic tables, restrooms with changing rooms, volleyball nets, a children’s playground, dune walkovers to the beach and lots of parking.